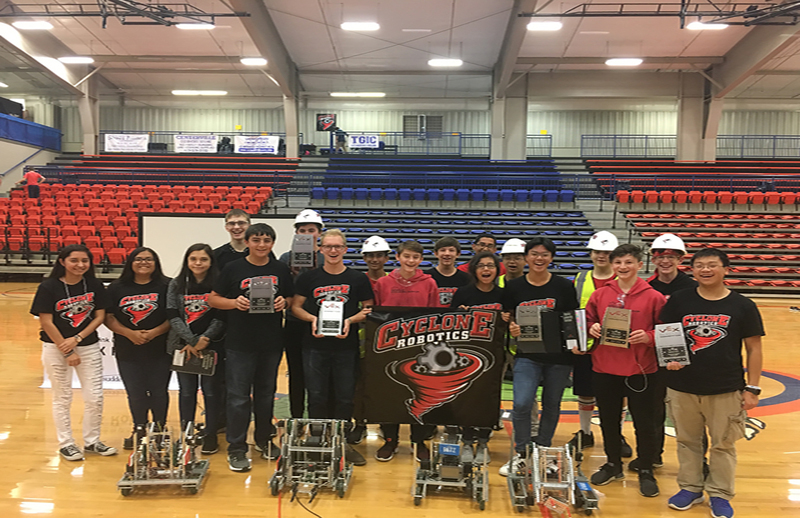 On Saturday October 20th the Russellville High School Robotics Team competed at the Two Rivers Spooktacular Tournament. RHS took three teams to compete in the tournament and brought home 5 awards. Team 967Z won the Tournament Champion Award for 1st place the single elimination tournament and the Robot Skills Champion Award for best combined programming and driving score. Team 967A won the Tournament Finalist Award for getting to the final match in a single elimination tournament, Robot Skills 2nd place for combined programming and driving score, and the Excellence award for best all-around team. Team 967Z is now qualified to compete in the State Tournament at Arkansas Tech University in March. Tathagat Prayaga is the leader of team 967Z with members Donnie Pagel, Jaedon Enchelmeyer, Jon Vickers, and Logan Jetton.